Thirlmere’s small township was once more inundated by thousands of visitors, and smoke, for this annual event. Street stalls sold everything from food to books to blacksmith items to themed clothing. Traction engines, stationary steam, oil, kerosene and gasoline engines were kept up a veritable mixture of exhaust aromas and noise. A Furphy’s Farm Water Cart supplied water for the really thirsty. Veteran and other vintage cars were on display. 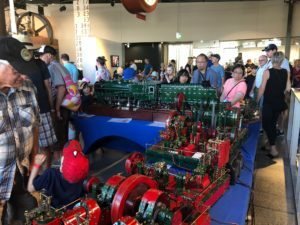 Model trains, roving characters in period costume and much more entertained the crowds. At least 5,000 visitors visited the NSW Rail Museum over the two Festival days. Five locos, in steam and smoke, dominated the museum’s coal scented thick foggy atmosphere. Each day two of them double headed six passenger tourist trains on Saturday and eight on Sunday from Thirlmere o Buxton and return. Leaving Thirlmere there was plenty of smoke and whistle blowing! The Meccano Display was strategically placed opposite the Museum’s two main entrances. 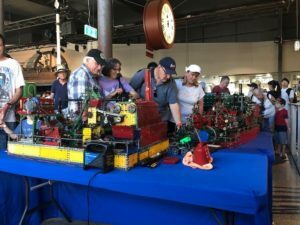 Hundreds of interested people and families came to inspect the models in the Meccano display, advertised in the Festival publicity brochure given to every visitor. Anna and I were flat out for the great two days. 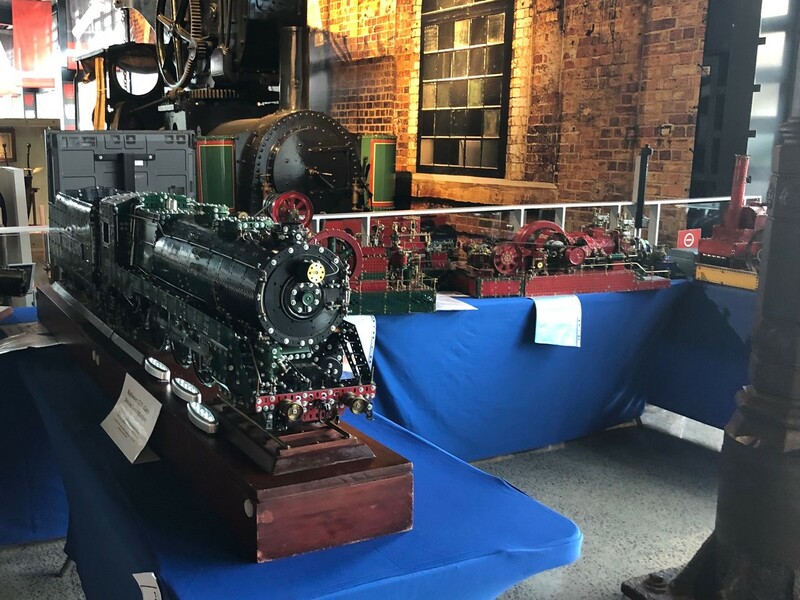 Display models included the 38class locomotive, a twin cylinder gas engine and refrigeration plant, a twin cylinder steam Mill engine, a Tangye Gas engine and a Tangye Steam engine (in one model) powered a butter churn. Children kept a windmill, a truck and drag saw, a dune buggy and merry-go-round really busy. 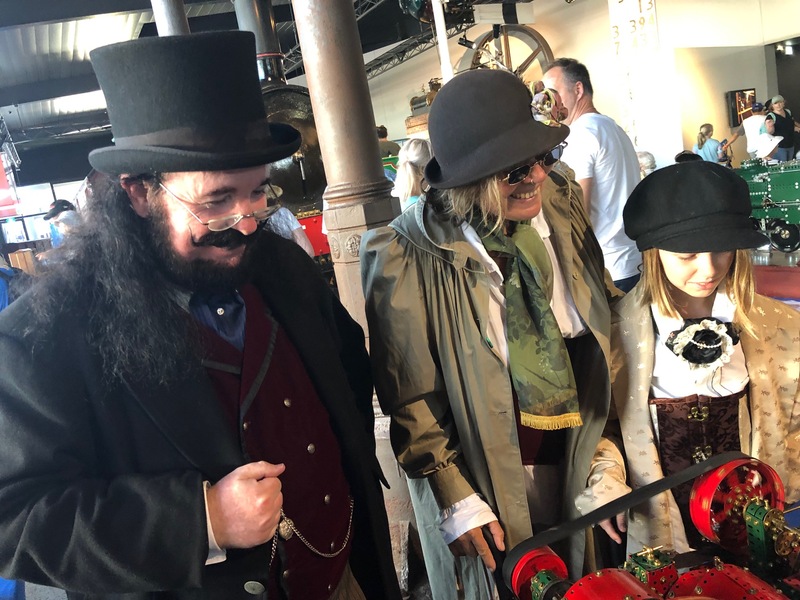 Two wonderful days at the Festival of Steam were, as always, a most rewarding experience for my wife, Anna, and me as we greeted an entirely new audience of all ages who came to look, question and discuss Meccano. FINALLY, a very big thank you to EVENT MANAGER, Ann Frederick, and her Museum staff for the Meccano display position and an entertaining and successful two days.